I don’t mean I took a trip on a UFO, I mean I’ve been on a crazy trip fueled by some dazzling, dizzying UFO questions hurled at me from some very unexpected sources. It all started yesterday morning, when I did a live Skype UFO Q&A call with some graduate students at Rice University in Houston, TX who have just read my biography of Dr. J. Allen Hynek, The Close Encounters Man. These Masters and Ph.D. candidates are taking a class in the Department of Religion entitled “Archives of the Impossible,” and they were ready with an hour’s worth of very deep, very serious questions about Dr. Hynek, UFOs and religion. It was an entertaining experience, and quite kick to know that my book is required reading for a Ph.D. level course! I got a surprise email from Leslie Kean, author of the hugely influential 2010 book UFOs: Generals, Pilots and Government Officials Go on the Record, asking if I could fact-check some information about J. Allen Hynek for an article she was writing for the New York Times. Of course I said yes — Leslie has been very generous with her time when I’ve approached her in the past, and I was happy to be able to return the favor. Imagine my surprise when Leslie told me she was writing an article pointing out the inaccuracies in the History Channel Project Blue Book TV series that just premiered last week! What a wonderful shock: She has as big a problem with this show as I do, and she’s going to say so in the New York Times! Halleluja!! Did Hynek ever crash in a plane while recreating a UFO dogfight that had been reported by a pilot?That’s a big NO! Did Hynek ever see what looked like an alien body floating in a tank in a secret facility, and take photos of it? That’s an even bigger NO! Did he ever meet Wernher Von Braun?MAYBE. Hynek determined the payloads on the launches of the Nazi V-2 rockets that we appropriated after the war, so it’s possible that he came into contact with some of the “Peenemunders.” But I think if he had met Dr. Von B there would most likely be some record of it…? Did Hynek ever watch as a UFO witness douse himself with gasoline and set himself on fire?Are you f***ing kidding me? That’s in the show??? When I expressed disbelief at the “UFO witness setting himself on fire” question Leslie kindly filled me in on the contents of the first six episodes. I’ve only seen the first, and it was pretty awful, but apparently the rest of the episodes are far, far worse. You can read Leslie’s article here. 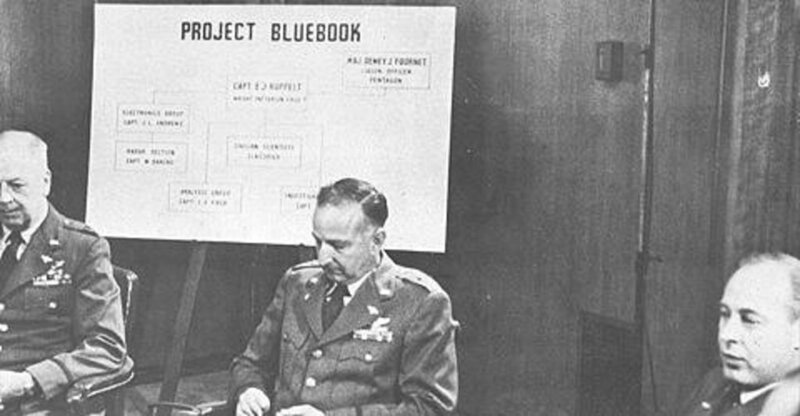 It’s a good first step towards blunting the impact of Project Blue Book and making sure the real UFO story is heard. So, yeah, I’m in a bit of a daze, and I’m not sure when it will let up… And I know for a fact that Dr. Hynek is rolling over in his grave.